Honoré Julien, one of Jefferson’s chefs during his Presidential years, ensured everything at the President’s House was ready “for the entertainment of company.” and kept in touch with the Jefferson after his presidency. In 1812, he mailed Jefferson his recipe for cream cheese, and in later years he accompanied his New year’s wishes with delicacies unavailable in the Virginia Piedmont – a Swiss cheese and garden seeds in 1818 and wild ducks in 1825. 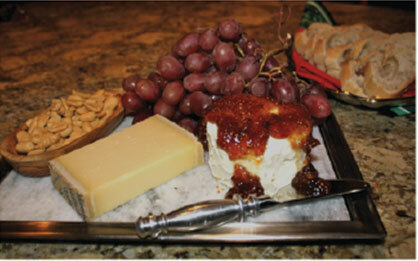 A truly inspired party platter for your New Year’s feast or next festive affair includes Fig jam fresh from the Fruitery, Virginia peanuts, grapes on the vine, a fresh baguette, and a variety of cheeses similar to those Jefferson enjoyed at Julien’s recommendation plated on The Shop’s Virginia Alberene Soapstone Cheese Board. Combine the cream cheese and goat cheese in a small bowl with the back of a fork until well incorporated and soft. Using a large cookie cutter as a mold, form the goat cheese mixture into a two-inch high circle. 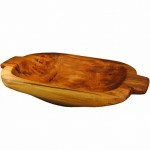 Place on the soapstone or cheese plate of your choice. Using a spoon spread the fig jam on top of the cheese mixture. Place the Swiss cheese next to the goat cheese mixture and accompany each cheese with the appropriate cheese spreader and knife. Drape fresh grapes next to the two cheeses. Transfer peanuts into a small bowl and place on platter. 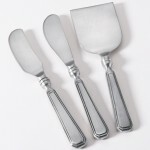 Set fresh bread in a bread basket lined with a cloth napkin and serve next to the cheese plate.